It is interesting to see how the victim card is being played by many of those who should have been speaking against the order of privilege. Long back, our friend and Editor of Dalit Voice, V T Rajshekar theorised Aryan-Zionist relationship. Rajshekar has been blunt and clear about his theory but perhaps he was too bold and open to be accepted by the political theoreticians who don our academia but yesterday’s ‘hurt’ feelings of the brahmins at the ‘ Smash Brahmanical Patriarchy’ posters has brought it again and this time it is coming from the ‘community’ ‘intellectuals’ and not from any ‘outsider’. A Brahmin ‘patrakar’ wrote that the brahmins have become like Jews being targeted everywhere and by everyone for no fault of them. Her ‘sentiments’ were ‘echoed’ by an important leader of the Congress Party too. Claims are being made that in the two thousands year history of India, brahmins were not in power and got nothing as it was ruled by the other than the brahmins. Can anything be more obnoxious than such arguments ? I explained yesterday too that brahmanism or brahmanical system is basically a caste based hierarchical order and any one can be like that. An individual Brahmin can be enlightened and can be out of his castes. Once you come out of your castes, you dont remain a Brahmin or a any caste person. It purely depend on your power relations. If you are powerful, you can do things which may not be liked by the Brahmins but they will still like to be attached to you. It is true for all other communities. We follow individual leader’s castes and not really their ideas. Nehru was an atheist but he was always referred as Pandit Nehru and brahmins felt proud of him. Brahmanical Social Order was not merely being run by brahmins but it has other actors too who were the ‘lathi’ holders to maintain the order. Brahmins unleashed the institutional violence that deny some people to attain knowledge while physical violence was left on the lathi holding non brahmin communities .The system was definitely invented by them. It was a unique invention which made India unique country the world, where your identity and caste is already defined before you are born. All our work too become predetermined. Most of the kingdoms in the past were brahmanical because they followed strict caste order as defined by the Brahmins. You may not have been the Raja but you were the Rajgurus and the king never functioned without your advise. Dont forget how you did the ‘rajyabhishek’ of Shivaji Maharaj. Remember Rama Killed Shambhuk, a shudra for reciting Vaidik hymn on purely your advise and not on his own. The non brahmin followers were the instruments through which Brahmanism wielded its power and absolute power. The poor brahmins must reflect about the untouchables particularly those who were forced to clean the human excreta, burning the dead, cleaning the street, skinning the dead animals and so on. You are upset with a few reserved seats which are not truly filled but why not abolish the caste based reservation which made you head of our religious institutions just on the basis of your birth whether you were knowledgeable or not. Why not abolish the reservation made for the Dalits to do specific jobs without any honorable compensation. Is untouchability not a crime like Apartheid ? Frankly speaking, is it finished. Have we followed truly our constitutional values ? Great that the Brahmin intellectuals or Savarna intellectuals are accepting that they are microscopic minority but should we be satisfied with this. The next line should make every one think over the system created by them. How come a microscopic minority occupy India’s huge resources. Isnt it true that Savarnas led by the brahmins have got access to disproportionate assets and resources. We all know that this microscopic minority is not really over 2% and yet it control every aspect of our life. Shouldn’t it worry all of us. 98% of India’s population suffers at the hands of a microscopic minority and yet they are trying to portray themselves as victims. Isnt it shameful? And more than that this linkage with jew. Yes, they were victimised by Hitler but what did they do after that. They have become worse than Hitler. Is the Israel state a role model for any one. Yes, it is for those who want to follow their model. Why is the jew hatred not towards Hitler but towards the Muslims. What did Muslim do to receive this barbaric treatment by the Jewish state. You settled over their homeland and now you want them to be out. Are the brahmins following the same pattern here. You occupy the Dravidian land and now you want to control them through dubious means when democracy is shaking the old structures. I dont believe that democracy today could shake the brahmanical control over India but it has jolted many because you have to make way for others. You have to sit with those who you hated once. You had knowledge but your knowledge did not strengthen democracy. Instead, your knowledge became an instrument to control the minds of others who you denied knowledge. Brahmanism or Brahmanical System or Brahmanical social order or Brahmanical Patriarchy need to be smashed but the problem is how ? My answer to this is the follow Dr Ambedkar’s alternative in Buddhism which is basically humanism. Humanism is the only alternative. Smashing hierarchies and creating an equal society will only be possible once we admit that there was a problem at the first place followed by democratic redistribution of resources among all. If we are not ready to accept and acknowledge that the Bahujan masses were maltreated and looked down upon by the caste structures created by Manu, it is difficult. If you dont admit it, the others will follow the same caste identities and it will take us nowhere except that some politicians and their parties may groom but in all, India will remain lagging behind in human development index. As long as young couples are being killed in the name of maintaining caste supremacy and purity of it, we will continue to feel that India remain caged in the prism of deep rooted caste based system which is called brahmanism. So long as Manu’s statue stand inside a High Court premises and lawyers fight for its installation there without feeling shameful, we feel that this brahmanical system is there. As long as a single man and woman die inside the dirty sewage system, it only prove that India has not moved an inch in removing the caste based hierarchies, in fact they are increasing. I have no faith in arguments that every individual who is born in certain caste is a saint or a sinner but it is time when we acknowledge these issues. There are many who are coming out of their privileges and extending solidarity against caste discrimination and untouchability. Many of the enlightened people had joined Baba Saheb Ambedkar’s movement and rejected the Manuwad. We need more such voices. Such people and voices need to be acknowledged. A twenty first century India must get out of this heinous and criminal caste system. It must be abolished if India want to remain united and civilised where each one live with Equality, Liberty and Fraternity as Baba Saheb Ambedkar had visualised, then it must follow humanist path shown by him and reject the old caste order. An excellent & eye opening article !! thanks for enlightenienlightening me on the root cause of India’s backwardness/problems- Brahminical Patriarchy !! Thanks, Mr. Vidya Bhushan Rawat, for your interesting article. It carries many information. 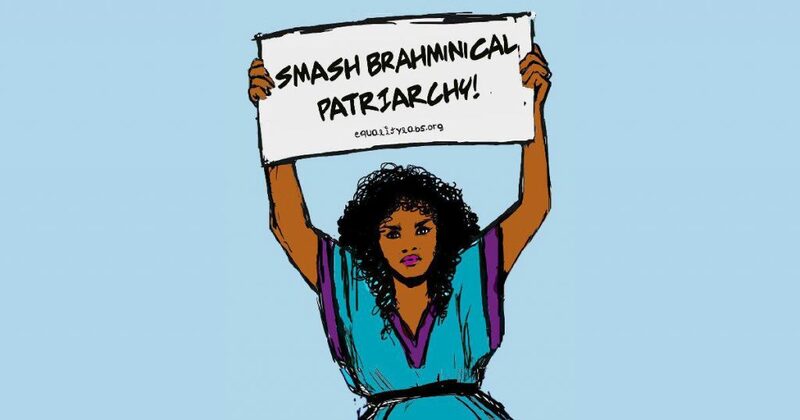 (1) Is patriarchy only Brahmanical? (2) Is it, patriarchy, absent among other parts/sects/castes/creeds in society(ies)? (3) What about those, if patriarchy is also found in those “holy” sects, etc.s? (4) What’s the root of this — patriarchy? (5) What’s the reason for targeting a single community? (6) Are the rest also nourishing patriarchy holy souls? (7) Shall not targeting a particular community, instead of the root, instigate hatred? And, if that — hatred — happens, is there any possibility of identifying you as a hatred-monger? (8) At the same time, shall not your method bolster forces nourishing patriarchy among other sects/castes/creeds? (1) Is it — the claim you have made related to the caste system — factual? (2) What about the communal division, which is called, broadly, communalism? (3) What about exploitation, the exploitative system, the exploitative property relations, the relations many ideologies/philosophies/politics/rights advocates avoid or hide or don’t discuss? I am trying to repeatedly raise these questions as there is an organized effort to divide the exploited masses in the name of color, region, etc. This is being done to further exploiters’/imperialist interest. Ultimately, it’s the working people, the masses of the exploited that are paying the price for this divisive politics. The politics is creating fratricide among the working people, which is benefiting the exploiters. Should not this divisive politics be resisted? Should any person claiming to be standing for people join this practice with divisive politics? In this article you refer to your friend and Editor of Dalit Voice, V T Rajshekar’s theory: Aryan-Zionist relationship. Is it correct? In one sense, in ultimate sense, all exploiters, all divisive ideology and politics are the same: anti-people, anti-working class, and for the exploiters. Nazism was patronized by a part of so-called liberal capitalists during Nazism’s early days, Hitler was patronized by other imperialist powers, Nazi party was financed by bankers and armament industry owners.The Aryan-supremacist ideology and the Zionist politics help each other from opposite poles, and with opposite appearances and postures. But, these two also have enmity to each other, which should not be missed and ignored. There are reasons/factors creating this enmity. Those are to be found out. A failure to find out that enmity, its source is equivalent to missing an important contradiction. Otherwise, the over-simplification creates confusion, and hurts organizing people’s struggle. So, the theory your friend made is over-simplification. In the work of formulating theory, there is no scope for over-simplification, not even simplification. Because of this approach of over-simplification and simplification, today, many so-called and genuine progressive persons in countries are joining imperialist designs; they are carrying on propaganda work of extreme-rightists.